Kiran Rao says Airbus will be number one in India for at least the next 10 years. The executive vice-president of the Toulouse-based plane manufacturer has reasons for his confidence. For one, it has just won the biggest single order globally, from IndiGo. Predictably, Boeing is not ready to concede defeat. 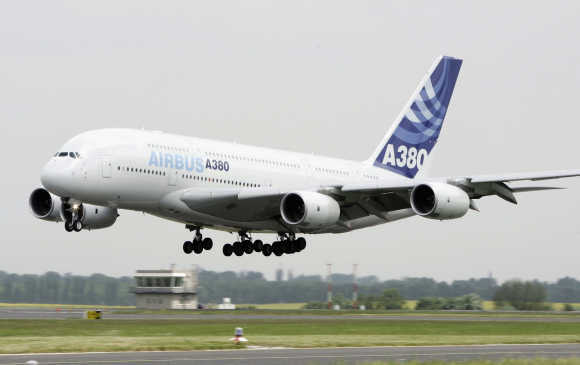 Dinesh Keskar, its high-profile senior vice-president (sales) for the Asia-Pacific, dismisses all talk of India turning into an Airbus market and says they will dominate the wide-body aircraft market and continue to have half the India market in the next 10 years. However, the numbers are disappointing for Boeing. India has been a 50:50 market for the two. Airbus has suddenly zoomed ahead with a backlog of 502 plane orders to be delivered in the next 10 years. That is more than four times the order book of Boeing's 130 planes. Primarily due to IndiGo's order of last week of an additional 250 A-320 neos. In 2011, IndiGo had ordered 180 A-320 neos, whose deliveries will begin from October 2015. GoAir has also played a big role in Airbus' ascent. The airline has ordered 72 planes of the same type. In contrast, Boeing's previous major order from India was in March this year, when low-cost carrier SpiceJet signed a deal to take delivery of 42 Boeing 737 Max planes. It also has a backlog of 15 aircraft on order. Boeing's also has an order backlog of 10 Boeing 787s from Air India (AI) and Jet Airways, and another three B777s from AI. Jet has also signed for a little over 50 of the B737 Max. That order includes conversions from one of its previous orders for earlier versions of B737s. However, neither Boeing nor Jet have made a formal announcement about this. The total backlog in Boeing's order book position from India is 130. However, that number might go up, as Jet is expected to order more planes. The factor that might give more momentum to Airbus' wings is that the two new airlines, Vistara and AirAsia, are Airbus customers, making Rao confident that Airbus will indeed dominate the Indian market. Vistara has announced that it will lease 20 A-320 aircraft from a leasing company to start its full-service operations. Similarly, AirAsia is expected to get six Airbus A-320 planes by the end of this year and is looking to add another 12-14 next year, which it will lease through its mother company. "Airbus enjoys both a majority in-service fleet as well as by far the largest share of orders for new aircraft." According to Kapil Kaul of the Centre for Asia Pacific Aviation: "IndiGo is the only differentiator in the narrow-body segment between Airbus and Boeing. Airbus' aggressive bet on IndiGo has worked magic for the plane maker. The wide-body segment is dominated by Boeing. However, I do not see such a large order by any other carrier in the near term." Till last month, globally, Airbus had 791 net orders and trailed Boeing's reported 1,106 orders in the first nine months of the year. Airbus is now confident of crossing 1,000 net orders (excluding cancellations or conversions from previous orders) in 2014. Boeing's Keskar, however, says there is enough demand in the Indian market. "If you look at GoAir or IndiGo, I do not think these airlines would order for another 10 years. I believe our customers, SpiceJet and Jet Airways, will go through two-three (aircraft) buying cycles in that period. I am confident Boeing will not lose its overall market share in India and we will still be at 50:50 with Airbus over the next 10 years," he said. He also notes Boeing has a dominant position in the wide-body aircraft market with a 80 per share. They have a backlog of 23 wide-body aircraft order in India, compared to not even a single order for a similar aircraft with Airbus.